The exhibition’s title reflects not so much a specific artistic point of view as rather the incessant challenge of the expressiveness of contemporary photography. Equipped with a solid basic skepticism regarding photography’s traditional promise to render an immediate image of reality, Leciejewski’s creative practice insistently confronts the medium with the question of which forms of truth can still be conveyed by aesthetic means. This critical-analytical angle is recognizable in ‘Zwœlf’ (‘Twelve’), a series of large-format portraits of artists in which the subjects, identified by their first name in the titles, appear in their work wear. The color photographs capture the sitters in extraordinarily rich detail, a realism that is both reinforced and irritated by the use of the garments that appear in the portraits as textile frame trimmings. Breaking the barrier between the photograph and the space around it, this alteration disrupts the self-contained image and turns it into an object soliciting the viewer’s touch. The fabrics heighten the closeness already conveyed by the depiction of the individuals into a form of intimacy. The aesthetic strategies Leciejewski’s works put into practice are always tailored to a specific project and its chosen subject matter and often pioneer novel uses of photographic processes and techniques. In another work, ‘A Circle Full of Ecstasy,’ he returns to the portrait genre, but with a very different approach and mode of presentation. Taking up an entire wall, the tableau composed of 77 unframed individual panels puts the more or less familiar exponents of the contemporary global political scene on display a few privileged individuals make two appearances. For the portrait series ‘Zwœlf,’ the artist had recruited artist friends of his own generation; the imagery in this work, by contrast, is drawn from his personal archive of collected press clippings. What unites the assembled distinguished characters on the international diplomatic stage is that they were captured in the instant when they raised their hand (almost always the right one) to greet a public audience that was sometimes present, sometimes imaginary. Another unifying element is the cyan blue in which all panels are bathed; in the overall view, it freezes them en bloc de glace, as it were. It speaks to Leciejewski’s experimental spirit that he produced this tone not by way of digital editing, which would have been easy enough, but by employing an old fine-art printing process called cyanotype. First invented in 1842, this process is now primarily associated with the British natural scientist Anna Atkins. For a moment one is tempted to suppose that Leciejewski’s political panopticon makes tongue-in-cheek reference to the botanist and illustrator’s published attempts at a scientific cataloguing of algae and ferns. Yet the recourse to a historic phototechnical process reveals a conceptual contradiction. In the early era of photographic history, the cyanotype was chosen because it promised the most accurate depiction (of scientific samples). In Leciejewski’s typology, the effect is the opposite: a retraction of the photographic realism possible today by means of the leveling color filter of abstraction. Reading ‘A Circle Full of Ecstasy’ row by row, the viewer gradually realizes that the title is proverbial. From picture to picture, the politicians in the pictures rotate by a few degrees so that, over the course of the series, the poses come full circle. Comparable to the mechanical doll on a music box, the movements of the robotic figures come to seem operated by the automatism of a blind machine. Poring over the images, one is filled by a growing sense of dehumanization and meaninglessness. The replicated greeting is on the verge of hardening into a vacant gesture. The circle is broken; the ecstatic entrancement collapses. The unsettling impression is that of a system malfunction and alienation whose mounting absurdity recalls ‘ghosts and flowers,’ Leciejewski’s critical contribution to the street photography genre: spectral and dysfunctional fragments of human persons, the by-catch of an Internet giant’s exhaustive scan of New York City’s urban reality. These Remarks on ‘The World in Their Minds’ would be incomplete without a brief excursus to 'A Scene in a Library,  the large-format photograph of a bookcase. It shows books and objects unconnected by a shared thematic reference, placed on the shelves in insular groups, an arrangement that seems haphazard rather than the product of some strict system. The viewer can make out some titles, but others are illegible, covered up by wrapping or effaced, as though the artist meant to signal that they belong to a private sphere to which he does not grant the viewer access. The desultoriness of the books’ placement is contradicted by their appearance before a uniform black back panel or backdrop, which accentuates the impression that this is a carefully installed display of selected significant objects, the precious elements of a concentrated still life. Leciejewski’s visual hint as to the writings on photography that inform his work might be read as a manifesto of sorts, even as an incomplete self-portrait. Moreover, the work is a tribute to book culture and a reflection on the creative interplay between the book and photography. Estelle Blaschke and Kito Nedo: Sensitive Territories: On Edgar Leciejewski’s ‘Zwœlf. Edgar Leciejewski: NYC, Ghosts and Flowers/How to Build a Sun, Leipzig 2011. Edgar Leciejewski: A Scene in a Library, Berlin 2016. László Moholy-Nagy: Painting Photography Film, trans. Janet Seligman, London 1969, 29. Where are the faces? The portraits in the series ZWŒLF the artist Edgar Leciejewski created in 2013 and 2014 have lost their faces. The large-format photographs—titles like “Inga,” “Matthias,” and “Roman” presumably refer to individual models—instead focus on their anonymous subjects’ bodies. Leciejewski posed them to face the camera head-on and took half-length portraits from the hips up. Then he abraded the pigment layer of the finished prints with sandpaper. Nothing remains of the faces but a white band across the pictures near the top. 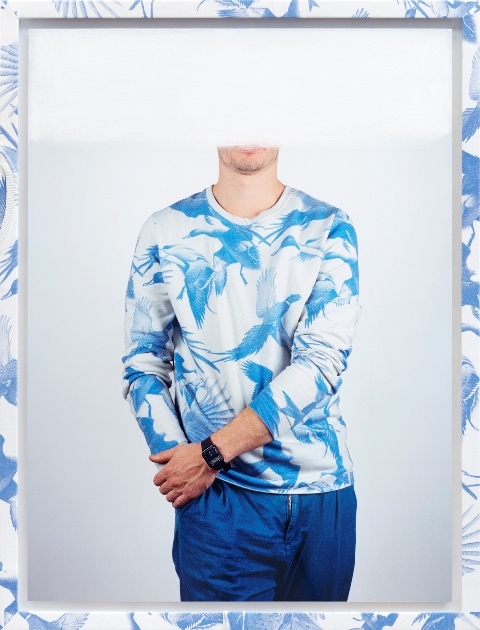 The series thus blends two seemingly antithetical intentions: anonymization and personalization. To emphasize the latter, the Leipzig-based artist approached the task of photographing his models before a white backdrop in his studio with the meticulousness of a surveyor charting highly sensitive territory: the format of each picture is tailored to fit the real size of the subject, apparently also in order to capture very specific postures and gestures. The resulting portraits combine gestural mannerism with a saturated palette. By obliterating the upper parts of the subjects’ faces and printing the pictures to scale, Leciejewski, in a simple and yet baffling move, brings up fundamental issues: What makes a portrait a portrait? Wherein lies the raison d’être of such likenesses? Is the face of the essence, or can the genre be expanded in other directions? If the pictures thus lack the putatively most important part, something has been added elsewhere: the artist repurposed the models’ clothes—a paint-stained sweatshirt or shirt, a wool jersey, a dark spandex bodysuit—as textile surfaces that, subtly altered, line the picture frames. The content of the image is displaced to its outside, where it becomes uncannily tactile. Perhaps it’s never an entirely harmless affair when friends and acquaintances, fellow painters, dancers, or writers photograph one another. Leciejewski, however, uses the camera to get uncomfortably close. He takes more than just a picture: the subjects are asked to sacrifice a favorite piece of apparel or their accustomed workwear. (How do you negotiate this sort of exchange?) And the artist puts no less pressure on himself: the unconventional frames effectively challenge us to compare the photographs to their subjects, to measure the work by the reality it depicts. The portrait is among the oldest and most important motifs in the history of European art. Over the centuries, the depiction of the human being evolved into an individualized format, though depending on the period and particular conventions, idealization, typification, and codification continued to play some part. Beyond the portrait’s likeness, the sitter’s pose, facial expression, dress, and other attributes were meant to convey his or her character, status, and social role. In a parallel development that began in the eighteenth century, physiognomy sought to determine, classify, and compare physical traits of the body (and especially of the face). These ideas also formed the basis for pseudo-scientific justifications of racism and theories of eugenics. The invention of photography (and subsequently of film) marks a quantitative and qualitative leap in the history of the portrait—the birth, as the Berlin-based cultural scholar Thomas Macho puts it, of the “facial society.” The more recent history of this pictorial genre ranges from Alphonse Bertillon’s anthropometric photography, meant as a tool for the identification and monitoring of individuals, across the boom in calling cards and nineteenth-century studio portraiture to the portrait as a field for experimentation, as in the aesthetic of the Neues Sehen in the 1920s and 1930s. By this time the portrait was firmly entrenched as the omnipresent visual type of the modern world. This profound shift in the use of media engendered the modern homo photographicus, who is inseparable from his pictures, as the historian Ulrich Raulff has noted: no one would ever be unpictured or faceless again. If the alleged verisimilitude of the photographic portrait was a crucial factor in its triumph, so was the fact that it lent itself to reproduction, to permanent repetition. Mass dissemination in the modern consumerist society gave rise to the media face or “image” of the person. We now live, as Macho writes, “in a society of faces: culture, advertising, politics, even business, it seems, can no longer operate without the circulation of faces.” This need for faces is universal: see the introduction of mandatory photographs on German health-insurance chip cards in January 2014, the rampant selfie hype in online social networks, or the research into biometric face-recognition software conducted by public authorities and private corporations. Meanwhile, on the web, people are already debating the new etiquette for parents who post pictures of their babies. Are they effectively ruining their children’s digital innocence by depriving them of any hope of future anonymity? The manual abrasion of the pictures invites us to speculate. Is this about a principled refusal? A hint that, instead of the old Warholian adage about fifteen minutes, the opposite might now be closer to the truth? Is rejecting history, legibility, and the deluge of portraits incessantly being produced and circulated the new luxury that only art can afford? Leciejewski takes a skeptical view of the promise of photography, which, more than any other medium, purports to show things as they are, to stop time and fix the “soul in the silver layer.” This skepticism touches on the tradition of a historical critique of pictures of the human being. Siegfried Kracauer wrote that “what appears in the photograph is not the person but the sum of what can be subtracted from him or her. The photograph annihilates the person by portraying him or her …”” As a mechanically generated likeness, he argued, the photograph steals the person’s soul and transmutes him or her into a rigid and dead light-graven image. The complexity that makes us human—the interplay between body, senses, emotions, space, and time—is reduced to pure surface. Yet Leciejewski’s work cannot be pinned down to the dramatism of the formula that the photograph of the human being equals death. “ZWŒLF” is not a statement of cultural pessimism; it’s an avowal of distrust articulated in thoroughly elaborated aesthetic form. What is at issue here is an attitude. The act of removing the face seems to be a simple and effective artifice that upsets the hierarchy of things and the automatisms of seeing: what used to be peripheral becomes the center of attention. The viewer’s gaze roams the image without a predetermined destination, scanning it, slowly, piece by piece. Minutiae, random details, and peculiarities strike us that may be read as the Barthesian punctum: notice the visible zipper fly in “Felix” (2013) or the birds—geese and parrots—in the style of Dutch tile designs on his sweater; the freckles, birthmarks, and neatly groomed feet, the toenails painted bright red, in “Helga” (2013); the resolute brawny pose “Ronny” (2013) has struck, discreetly giving us the finger; the reddish-brown stubble on “Matthias” (2013). Looking at the entire series, we realize that the subjects have absolutely nothing in common. Indeed, they differ from each other in all conceivable details. Pose, body, skin, clothes—an infinite space of possibilities, constellations, and variables opens up before us, held together by the photographer’s work. And the headless likenesses appear anything but frozen. On the contrary: the subjects’ postures and gestures, whether they are reserved, delicate, weird, or demanding, possess a captivating presence. The bodies and especially the hands communicate with the viewer, even if we can’t be quite sure who or what we’re looking at. The impression of animation extends to the level of form: as the traditional fulcrum is removed, the parts of the body and details reorganize themselves. They are in motion, and each may become a center in its own right. This tendency toward disintegration is in turn counteracted by the frame, which deliberately confuses inside and outside and thus becomes a compositional tool of sorts. A frame marks an aesthetic unit and unequivocally declares it to be a work of art rather than a piece of reality. It transforms the picture into a three-dimensional object and, even more importantly, into a unique original, in defiance of the flatness and reproducibility of photography. The viewer thus finds himself caught in a tangle of potential references and contradictions: the photograph as a surface, as the “skin” of the subject, clothes as a “second skin,” and the picture as a material body. Like earlier works by the artist, “ZWŒLF” represents an attempt to reach the heart of photographic imagery. It seeks to reveal the complex interdependencies between production, visual codes, and beholding. Considered in this perspective, Leciejewski’s work may also be a kind of anti-photography. Paradoxically, it brings an entirely new class of images into being. Thomas Macho: Abweichung und Idealmaß: Zur Funktionalisierung der Gesichter in der Moderne. In: Petra Lutz (Ed. ): Der imperfekte Mensch: Metamorphosen von Normalität und Abweichung (Köln: Böhlau, 2003), 31. Ulrich Raulff: Image und das öffentliche Gesicht. In: Dietmar Kamper and Christoph Wulf (Eds. ): Das Schwinden der Sinne (Frankfurt am Main: Suhrkamp, 1984), 53. Thomas Macho: Abweichung und Idealmaß, 31. Newspapers have reported that many policyholders have refused to provide self-portraits to their insurers, submitting photographs of cars, cats, or pop stars instead. Amy Webb: We Post Nothing About Our Daughter Online. Online: www.slate.com, September 4, 2013 (accessed March 2014). Rudolf Arnheim: Die Seele in der Silberschicht: Medientheoretische Texte. Photographie—Film—Rundfunk, ed. by Helmut H. Diederichs (Frankfurt am Main: Suhrkamp, 2004). Siegfried Kracauer: Photography. In: The Mass Ornament: Weimar Essays. trans. and ed. by Thomas Y. Levin (Cambridge, Mass. : Harvard University Press, 1995), 57. EDGAR LECIEJEWSKI explores the various social and scientific uses of photography. His work employs an experimental, analytic approach to the medium of photography by using various techniques and media. Besides content-related issues and the reflection of his own work, he is interested in issues such as the rhetoric of the photographic series, the photographic genre, the composition, and how as much time as possible can fit in a single photographic image. His pictures are repositories of time that allow for the slowing down of the act of seeing. Leciejewski’s work has been exhibited amongst others at Witte de With Center for Contempoary Art Rotterdam, Schirn Kunsthalle Frankfurt, Kunsthalle Wien, Museum der bildenden Künste Leipzig. Leciejewski lives and works in Leipzig, Germany.